In this December 2011 file photo, Gov. 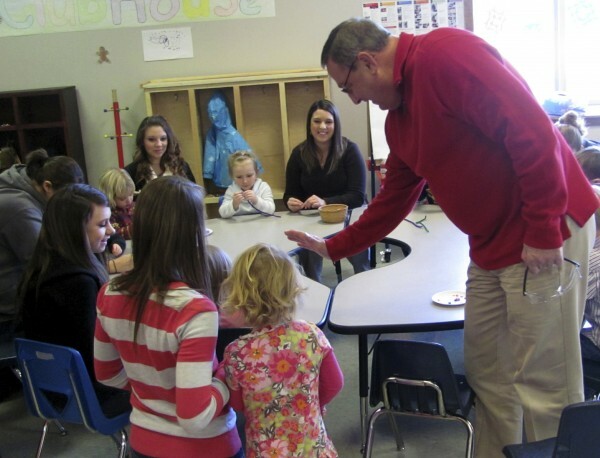 Paul LePage high fives a preschool student who attends Caterpillar Clubhouse, which is part of the early childhood education program offered to high school students at Hancock County Technical Center in Ellsworth. Preschool is powerful. Or, at least, it can be. It all depends. It depends on teachers’ qualifications. It depends on how long children attend, what the curriculum is, whether children are getting enough to eat, whether parents are involved, if the teachers get ongoing professional development. Importantly, it also depends on a way to measure how programs do, so teachers can adapt. Getting to “powerful” takes continued, persistent effort. It requires partnerships between schools and other child care providers. And it demands funding. A bill under consideration in the Maine Legislature to require school districts to offer preschool for 4-year-olds by the 2018-19 school year isn’t there yet. LD 1530 has the best intentions. It is an idea we wish had been seriously discussed long ago. But, as written now, its effects will probably be minimal. There are three big reasons. First, most school districts — 63 percent of those with kindergarten classes — already offer preschool. Second, the best programs accept newborns and toddlers, not just 4-year-olds. Third, a funding source is not clearly identified. The bill would take higher-than-expected casino revenues dedicated to education and give them to districts for their first year of start-up costs, before the regular funding formula kicks in. One problem is the casino revenue projections are just that — projections. Does the state want to fund a new mandate for districts by relying on an unreliable pot of money, especially before it figures out how much preschools will cost? This bill is an opportunity, don’t get us wrong. We want Maine’s littlest to have the best, most robust preschool programs available, to ready them for kindergarten and beyond. The programs are most needed by children growing up in low-income households. But if the Legislature doesn’t do this right, preschool will become a point of division between districts and the state; it won’t result in the powerful outcomes it otherwise could; and opponents will likely use that fact in the future to argue in favor of cutting funding, making it more difficult to expand public preschool to include infants and toddlers. We understand the legislative Education Committee is running out of time, so we’d suggest including language in the bill to ensure a roadmap forward. It would also direct the group to create a plan for how best to expand preschool to more ages, to ensure the programs have the greatest effect possible. Without more of a long-term view, we fear Maine will lose an important opportunity for parents and their children. Many people — police, business owners, military members — favor increasing access to early childhood education. The tricky part is figuring out how best to expand programs and ensure they are funded at a level that allows them to flourish. LD 1530 is welcome and important, but it could — and should — be strengthened.